I would like to highlight several resources describing what programmers must know about how computers work. An article ‘What every programmer must know about memory’ by Drepper (linked below) talks primarily about NUMA CPU and L1 and L2 caches. Although a little dated, it is still very valuable. The reason it is dated is that we are not optimizing our code just to lay it out on cache lines anymore, although alignment is and will be incredibly important. Alignment of data in general is very important and in some cases mandatory, for example, when we pass data from the host (CPU) to an accelerator (GPU) using constant buffers the data must be aligned, but we have to worry about a lot more in modern computing, only five years since the article had been written. 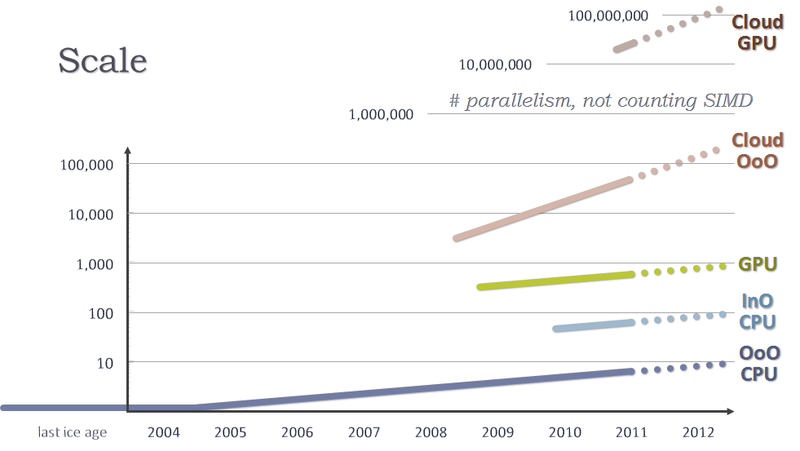 Hardware and hence programming have changed significantly since 2007 and if we look at the following graph which I borrowed from Herb Sutter’s article (reference below), we can make a conclusion that our code now must be written for a variety of devices and accelerators and we have to be able to visualize code architectures executing in parallel on thousands of cores. We will not see significant performance gains in single thread applications in the future by merely upgrading to a new hardware. 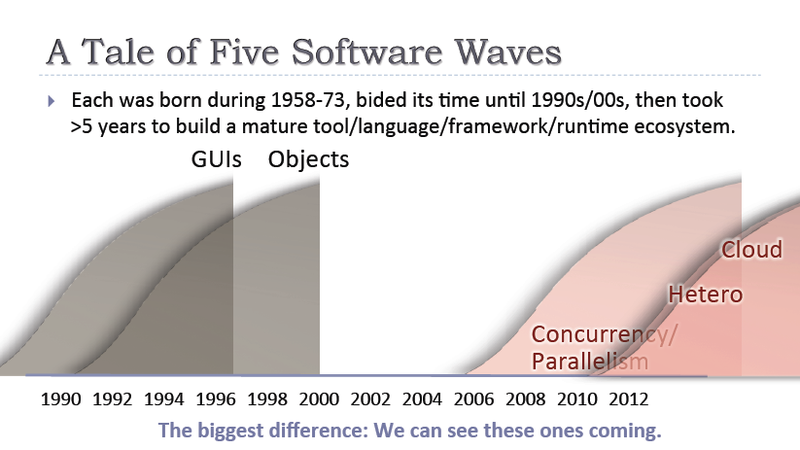 There will be some gains based on advancements in new compilers, but the lesson is that we have to start thinking in terms of computing in the cloud (borrowed the following picture from Herb Sutter as well). Please read the Drepper’s article to understand how L-caches work. I will also refer you to Mark Russinovich presentation to understand how modern RAM memory is managed (at about minute 23 in video #2). 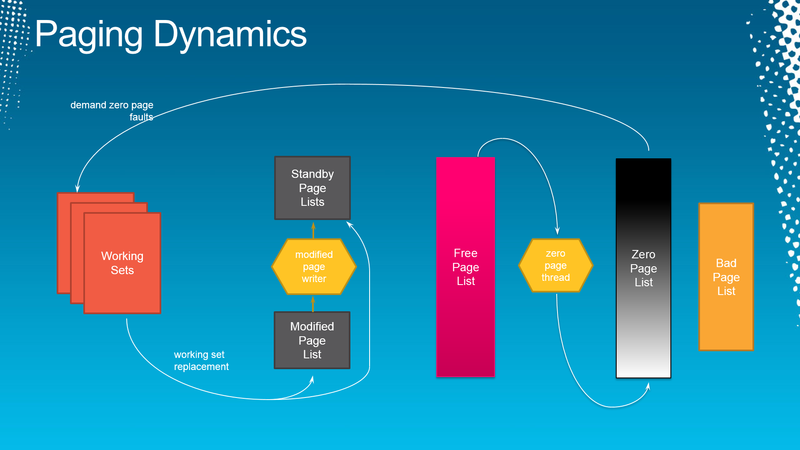 The following images were borrowed from the presentation. and starts moving them to the Zero-Page list. The operation is highly optimized and performs as fast as hardware allows. Once memory allocations are requested, the system starts creating working sets grabbing pages from the zero-page list. Once the working set grows big enough, the system starts trimming it by moving pages either to the stand-by list from where they can be reused immediately (this is an instantly reusable cache of pages that can be sent back to the working set) or to modified list. Modified list is a list of pages which were written to or modified by an executing program and must be persisted to the disk. This operation is ‘lazy’ where a worker (modified page writer below) periodically wakes up and flushes the page out and then moves it to the stand-by list. Global valid fault is a shared page reused between several processes, you can see it in VMMap from SysINternals under sharable memory. 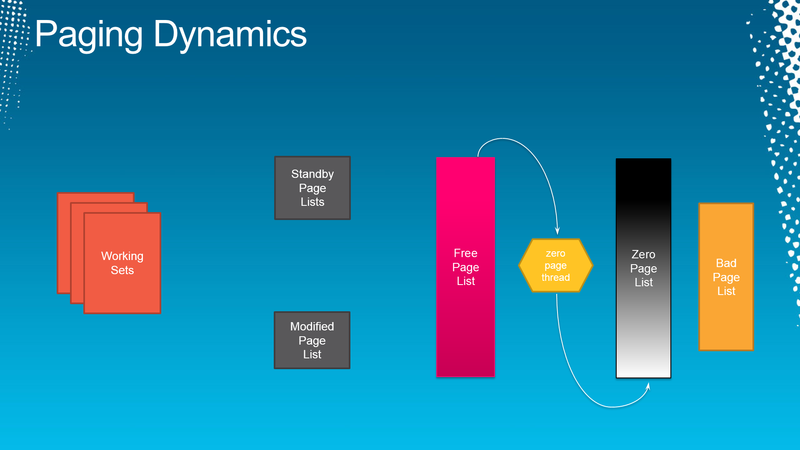 Once a page is released (stack is released for example), the page is put back onto the free-page list. Because the page contains private data from a process it cannot be reused and given to a different process, it must be reset. Below screenshot from process explorer shows the breakdown and available memory sizes on my machine. You can see that free-page list has nothing in it, but there are many pages on the standby and zeroed. I wanted to close with some information you can get by running SysInternals tools and PowerShell scripts. For example, in the following output from CoreInfo important information is LineSize (please read Drepper to understand why) and L-cache information.